Katie O'Malley has the latest going into tonight's game. With Brooks Orpik (concussion) joining Paul Martin (fractured tibia) and Rob Scuderi (broken ankle) on injured reserve after what happened in Saturday’s game, the Pens are now without three of their top-four defensemen for the forseeable future. But they aren’t going to ask their remaining blueliners to try and replace those guys. They want whoever is in the lineup to play their game. The only difference is that now, they’re going to get a chance to showcase what they bring more often and in different situations than perhaps they’re used to – whether it be on the power play, penalty kill or matching up against the other team’s best players. While Kris Letang conceded that obviously the D will have a different look with those guys out, he said the Pens have learned from experience each individual can't try to play outside of the way that's made them successful NHLers. "I think that’s the mistake a lot of people do or want to do. Try to change," he said. "But we lived it in 2010 when 'Geno' (Evgeni Malkin) and 'Sid' (Sidney Crosby) went out with injuries. There’s no point for doing more or changing the way you are. Just have to play the same way and things will take care of itself." 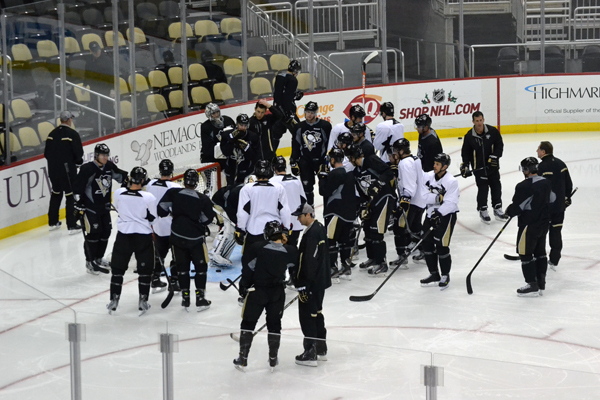 For the more experienced guys like Letang, Matt Niskanen and Deryk Engelland, taking more of a leadership role for their younger teammates like Olli Maatta, Simon Despres and Brian Dumoulin in addition to shouldering more responsibility on the ice will be important. “I’m not going to change a whole lot just because of who’s missing or anything,” Niskanen said. “I’m not going to try to be anything I’m not, but there is, I think, a necessity for a little bit more of a leadership role out of some of the experienced guys. There’s virtually no question that Letang, a finalist for the Norris Trophy as the league’s top defenseman last season, will see the most of those important minutes. He skated over 30 in the last game, a season-high for him, while playing on the top power-play unit and being one of the first penalty killers over the boards. The key to handling all of that ice time, he says, is to be cognizant of your workload. “It’s just a question of managing your minutes, making sure you don’t join every rush and try to get back in the play and lose a lot of energy in that regard,” he said. Judging from the pairings in this morning’s skate, it looks like Engelland, who had been paired with Orpik, will now play with Niskanen while Maatta will remain with Letang. Bylsma said that Robert Bortuzzo will be in the lineup tonight for just the second time in the last 13 games, so he will play with either Despres or Dumoulin – recalled this morning from WBS and looking to make his NHL debut. For the group as a whole, Niskanen agreed that keeping it simple may need to be more of a focus with guys adjusting to different roles and minutes. That’s what they’ve been doing all year through the injuries. The Penguins-Bruins Saturday contest got pretty ugly on the ice to say the least. And the fallout is still being felt by both teams. The NHL handed down its ruling on Neal for kneeing the head of Brad Marchand. Neal has been suspended for five games without pay. The scariest moment of the game was no doubt Orpik losing consciousness and being taken off the ice by a stretcher after an altercation with Shawn Thornton. 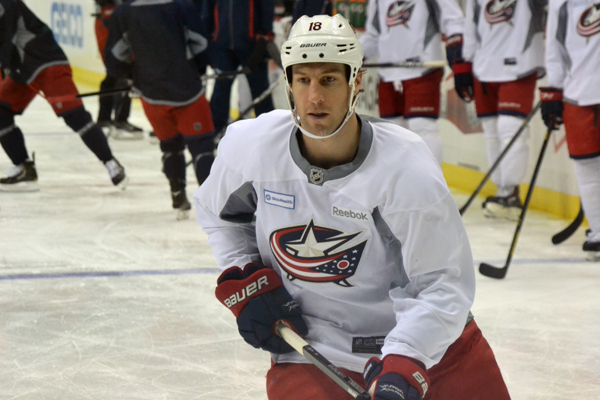 But coach Bylsma had some positive things to say about Orpik's current condition. The tone was set for the game in the opening 15 seconds when Orpik leveled Boston’s Loui Eriksson above the circles in the Bruins zone. The puck was coming around the boards and Eriksson tried to play it. Orpik committed to the hit and followed through. A few minutes later Thornton challenged Orpik to a fight, but the Penguins defenseman declined – which, as Kris Letang pointed out, is his right. And Bylsma agreed that every big hit doesn’t need to result in fisticuffs. The Bruins also lost Chris Kelly with a fractured fibula for the next 4-6 weeks as a result of Pascal Dupuis’ follow-through on a dump-in attempt. Dupuis had the puck at the Bruins blue line and tried to dump it. The puck took a weird bounce and ended up in the skates of Kelly. 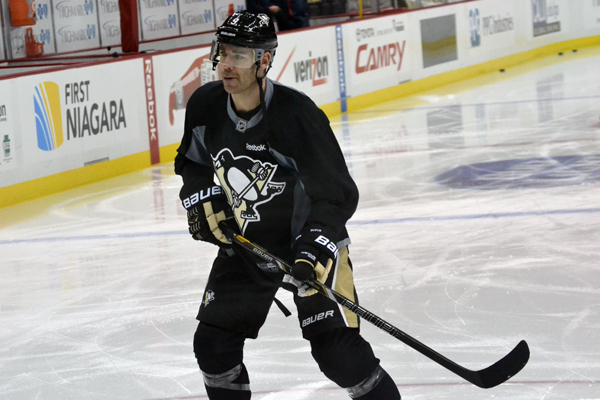 Dupuis swiped his stick at the puck on the backhand. Unfortunately, Dupuis’ stick missed the puck and unintentionally caught Kelly. 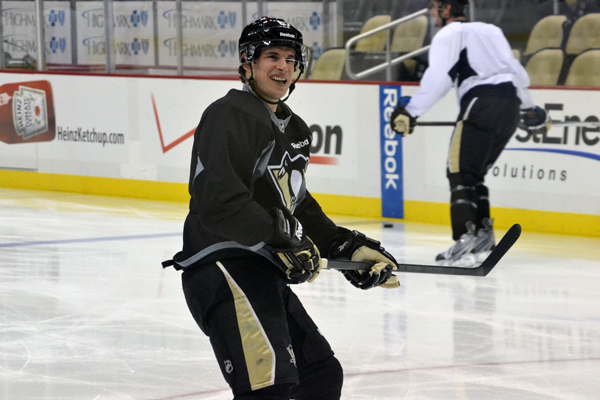 “I tried to whack at the puck to get it deep,” Dupuis said. “I turned the puck over trying to put it deep. I guess I got him on the back of the leg. It’s unfortunate. You don’t want to injure players. Hopefully, he gets back on the ice quick. 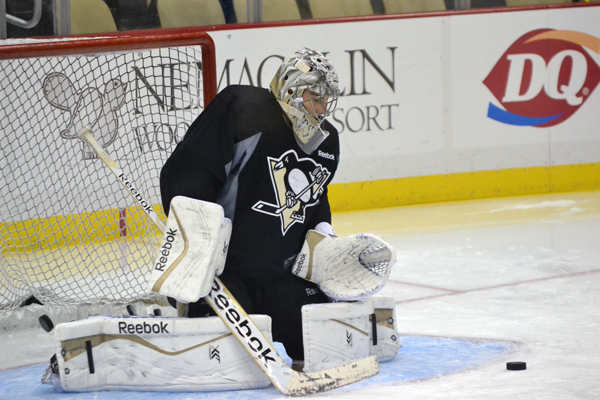 Marc-Andre Fleury is starting in goal for the Pens. The rest of the lineup will be game-time decision. 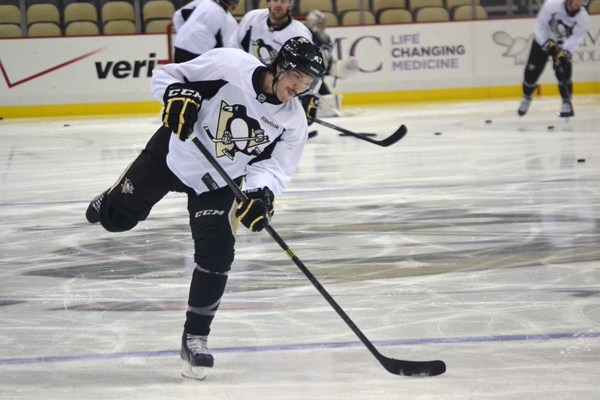 The injuries are piling up for the Pens, but they did have some good news on the injury front. 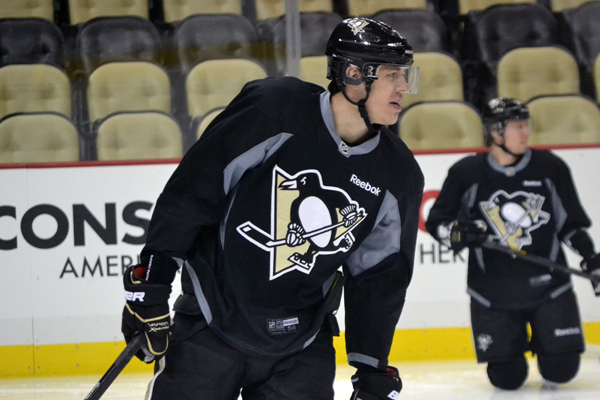 Center Evgeni Malkin was on the ice for the team's morning skate AND participated in line rushes. James Neal did work on an extra unit line. PP1: Malkin, Letang up top. 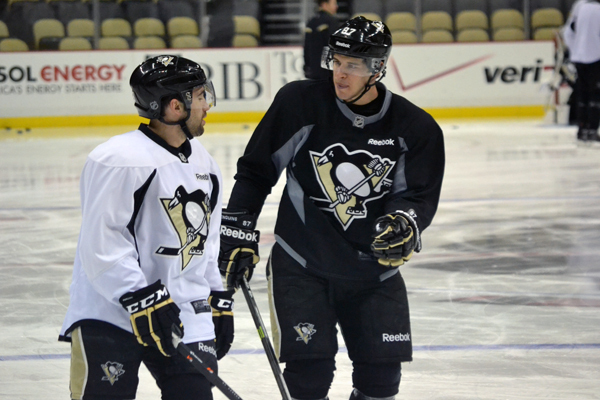 Jokinen, Crosby & Kunitz down low. PP2: Maatta, Niskanen up top. Sutter, Kobasew & Dupuis down low. Orpik has been placed on IR. No surprise there. He's going to need time to get back to health. In the meantime, the Pens are now down three of their top-4 defensemen (Orpik; Rob Scuderi, ankle; Paul Martin, tibia). Due to the rash of injuries on D the team has recalled Brian Dumoulin from WBS. Dumoulin, 22, has notched six points (1G-5A) in 22 regular-season games with WBS this year. 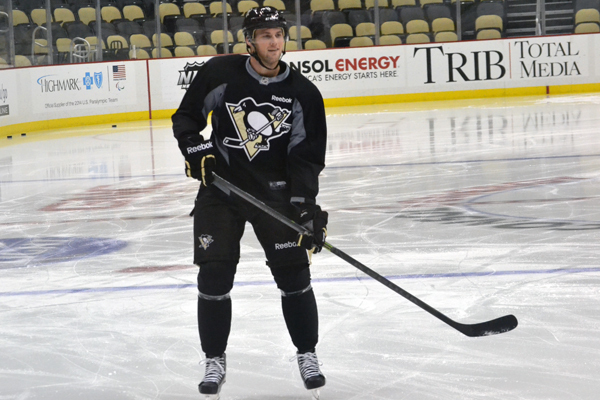 He appeared in one preseason game for Pittsburgh, collecting one assist and finishing plus-1. For a preview of tonight's action click here. If you're coming to the game tonight here is the fan guide. 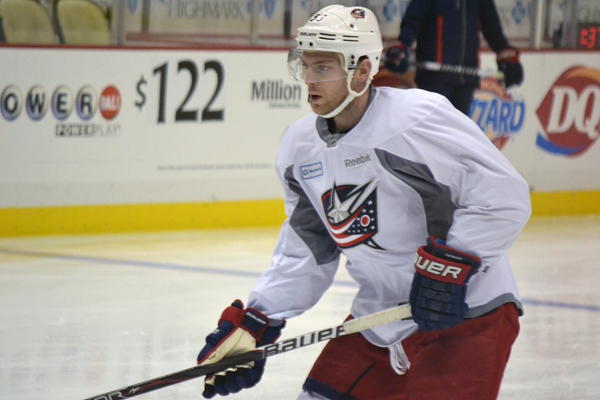 For a scouting report on the Jackets, watch the video below from yours truly. Good morning hockey fans! Tonight the Pens will host the Columbus Blue Jackets for a divisional showdown at CONSOL Energy Center. Let's get started with some game notes! The Penguins begin a brief two-game homestand against the Columbus Blue Jackets (TV: ROOT SPORTS; Radio: 105.9 the X) at CONSOL Energy Center. Following tonight’s game the Penguins will have three straight days without a game for the first time in a month before hosting New Jersey on Friday night. Pittsburgh last had three straight days off on Nov. 10-12. Including tonight’s game, the Penguins have played 15 games in 27 days dating back to Nov. 13. Thus far, the Penguins are 9-4-1 during this stretch. The Penguins enter tonight riding a five-game home winning streak –tied for their longest such streak of the season. Pittsburgh won its first five home games between Oct. 3-19 before dropping a 1-0 setback to the Colorado Avalanche on Oct. 21. Pittsburgh has won three straight games against the Columbus Blue Jackets. A win tonight would give the Penguins their longest alltime win streak against the Blue Jackets. The Penguins are 7-1-1 in their last nine overall meetings with Columbus. Today's song is Pearl Jam's "Lightning Bolt" courtesday of @gregroe72. We're playing this for Brooks Orpik. Pearl Jam is his favorite band and we hope he makes a speedy and healthy recovery.